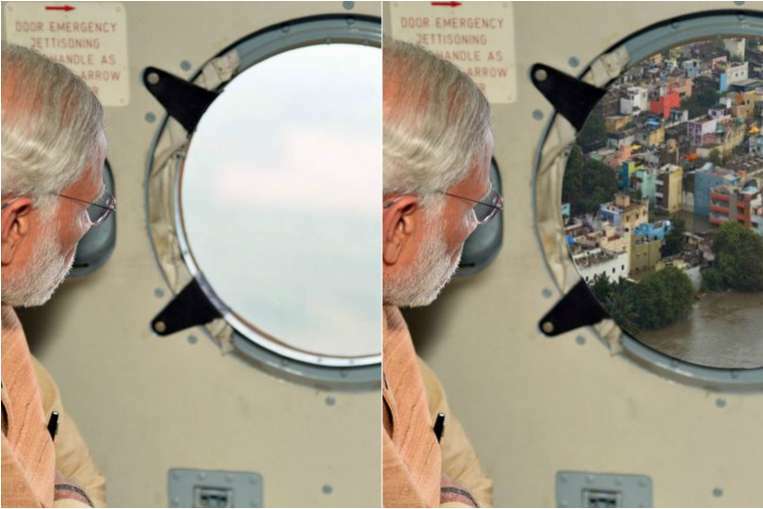 India’s Press Information Bureau (PIB) is facing online mockery after posting on Twitter an edited image of Prime Minister Narendra Modi surveying deadly Chennai floods. The state-run bureau initially re-tweeted Narendra Modi’s photo of himself looking through a plane window, with submerged fields and buildings visible. Hours later, they tweeted the same image again, but with a much clearer scene pasted on to the window. The second tweet was deleted but not in time to prevent social media ridicule. The PIB has made no public comment yet. PM Narendra Modi flew to Chennai (Madras) in Tamil Nadu state on December 3 to see the damage caused by the widespread flooding, which has left more than 260 people dead since last month. A large-scale rescue operation is under way, amid neck-high water in some areas. It isn’t the first time Narendra Modi has fallen victim to some amateur image editing. In 2014, before Narendra Modi became prime minister, a fake photo showing President Barack Obama watching one of his speeches went viral. Commentators on Twitter suggested the image was released by an ardent Narendra Modi supporter trying to imply the US president was following Modi’s election campaign.